Research in the subtropics during the 1980s and 1990s was challenged by such beliefs that coffee “must have shade to produce high quality” that “hand-picked coffee is better quality than machine harvested coffee”, or that “high altitude is required to grow the best quality coffee”. Many of these observations were dispelled when a professional taste panel in Sydney in the early 1990s blind taste-tested samples of green beans from field trials in the Tweed Valley. These taste tests soon showed that coffee quality was not simply a function of altitude, variety, or location, but a combination of all these including soil type, microclimate, and the coolness of the ripening period, which could be achieved at high altitude, high latitude, or under shade. Having studied coffee growing and harvesting in Brazil, Hawaii, Sri Lanka, and Colombia together with our own observations in Australia, I was convinced that German author Berhard Rothfos had it right in 1985 when he said “quality does not depend on the coffee’s origin or method of preparation”. The Australian Subtropical Coffee Association (ASTCA) recognised the importance of these factors affecting coffee quality and has focused its promotion on the “terroir” of the region. The field trials in the 1980s and early 1990s resulted in the K7 cultivar being selected from a range of 19 Arabica varieties, mostly collected from the collection at Kamerunga Research Station with a local selection of Condong Range Bourbon included. This was probably a local adaption of the original plantings in the 19th century. Through the Australian Coffee Industry R&D team, Queensland Department of Primary Industries researchers Ted Winston and James Drinnan greatly assisted the development of the NSW industry with their technical expertise and energy. After more than five years of conducting trials in northern New South Wales, the K7 variety from Kenya showed the most potential. It had many attributes including rust resistance, suitability for machine harvesting, high productivity, and liquoring quality. It is still the dominant variety in the subtropics today. However, the K7 has a weakness, which was only discovered in the mid 1990s. It has now proved to be too vigorous. Over the past decade, the need to prune the trees regularly to maintain productivity and suitability for machine harvesting has threatened the viability of coffee growing in this region. Producers who simply grew coffee or had it processed off-farm to the green bean stage found it difficult to survive. Recognising this obstacle, the ASTCA began the search for a new range of semi-dwarf varieties, which did not require regular pruning. It met with Southern Cross University (SCU) in 2014, and with financial support from the Rural Industries Research and Development Corporation, now Agrifutures, began the search to find a semi-dwarf variety with the attributes of K7. 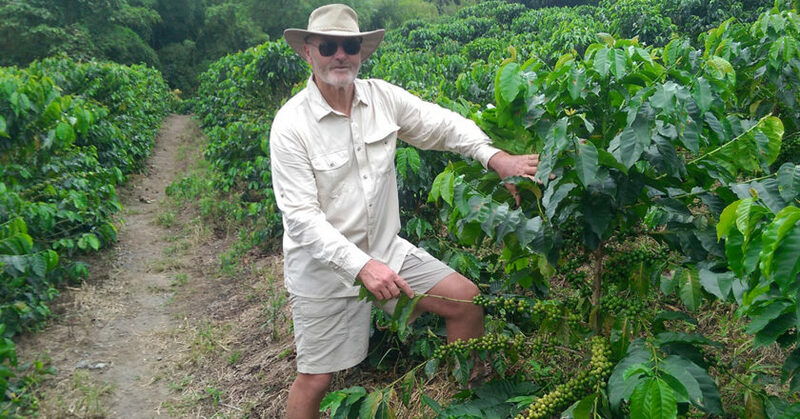 The project funded my study tour of Colombia and Brazil in 2015 to investigate coffee breeding programs run by Cenicafe Research Centre in Colombia, and the Coffee IAC Research Centre in Brazil. Six varieties met the criteria for suitability for the subtropics in Australia, and access to these varieties is still being negotiated. On another front, ASTCA and SCU have now agreed to become part of the World Coffee Research Variety Evaluation Program to introduce a wide range of varieties and evaluate their suitability for Australian conditions (see June 2018 edition of BeanScene). So, after a rich early coffee producing history more than 130 years ago, its demise in the 1920s, and a resurgence in the 1990s, the Australian coffee industry in the subtropics is again at a crossroads. We know we can produce high quality coffee without the major pests and diseases, which affect coffee overseas, and the demand is there. There is no danger of over production as there is limited suitable land for machine harvesting and frost-free production. All that is needed is a new variety suitable to our environment and machine harvesting to make coffee growing an attractive enterprise for new entrants. This article appears in the February 2019 edition of BeanScene Magazine. Subscribe here.